We believe that knowledge of the entire Bible, God’s Word, is essential for our children (in fact, for all people). But we’ve been getting requests from homeschooling moms who want to study the first five books of the Bible with the whole family together verse by verse, without skipping anything! They believe that these books of Moses (called the Torah) will give their children a foundation for the rest of the Scriptures and prepare them to understand who Jesus (Yeshua) is and what He did for them. They want a study with some meat to it, that really digs into Scripture. That’s why, beginning in 2013, we began developing a Bible curriculum specifically based on the Torah (Genesis, Exodus, Leviticus, Numbers, Deuteronomy). It has now been tested by over 1,000 families. We invite you to take a look! …recalling how from childhood you have known the Holy Scriptures, which can give you the wisdom that leads to deliverance through trusting in Yeshua the Messiah” (2 Timothy 3:15, Complete Jewish Bible). Study the first 5 books of the Bible verse-by-verse, beginning with Genesis 1:1. A firm foundation for Biblical understanding will be laid. Show your children how the Torah points to Yeshua the Messiah and to salvation only through His Name. Learn how to live a holy life, focused on loving God and loving others. Teach your children how to study the Bible for themselves, using inductive and deductive methods. Through daily use, teach your children how to handle their Bibles, understand what it means, and apply it to their lives. Commit weekly verses of Scripture to memory, hiding it in your hearts so your family will not sin against God. Optionally study along with your local synagogue or congregation that uses “Torah portions” in their weekly teaching and reading cycle. A variety of activities for multiple ages means that families will read together, study together, and grow together… making life easier for Mom and simplifying your homeschooling day. We believe that knowledge of the Bible, God’s Word, is essential for our children (in fact, for all people). How can we know how to live in a way that is pleasing to God if we are not familiar with God’s instruction manual? Many homeschooling curriculums seemed to follow a haphazard approach to learning the Bible, leaving possible gaping holes in our children’s knowledge of God. We couldn’t find a homeschooling company that followed a verse-by-verse approach to the Torah (Genesis to Deuteronomy). Why was this important? If our children didn’t come to a clear understanding of God’s nature and character, their own sinfulness, God’s provision for sin through the Tabernacle and sacrificial system, the beauty of the biblical feasts of Leviticus 23, and the Messiah’s all-sufficient saving work through His death, burial, and resurrection, then how could they understand God’s plan of salvation and have certainty of their faith in Him? Even more, how would they know how to live holy, set-apart lives each day, so that they could grow as believers? Many homeschooling curriculums fail to teach the Bible consistently as one book, just as God has progressively revealed it to us. Instead, we saw hit-and-miss teachings, full of cute Bible stories and character-training devices. We were convinced that if our children came to know and understand God’s plan for their lives as revealed in the foundation of His Torah, they would develop Godly character as a natural by-product. Since the majority of Christian teaching emphasizes individual doctrines of the Bible rather than presenting the Bible as one complete, interdependent revelation of God, the result is often heresy, as well as the misinterpretation and overemphasis of certain Scriptures. How many lifelong church members have never read the first five books of the Bible, or feel that Leviticus does not apply to them? How many have even read through the Torah in its entirety just one time? We didn’t want this for our children. Since the majority of Jewish teaching emphasizes the Talmud, Mishnah, and sages over the words of our Master, Yeshua of Nazareth, we were searching for Torah curriculum that would always focus our attention on Yeshua as the only “way, truth, and life” (John 14:6). Finally, when we found a Torah-portions curriculum, it was written for just one age group to use, usually in a classroom setting. We were searching for a curriculum that we could use to teach all of our children, all at the same time. That’s why we developed our own Torah portions curriculum for homeschoolers. We offer a full-year course through the Torah that takes from between 50-55 weeks to finish, depending on the year. If your local synagogue or congregation reads from the Torah each week, we highly recommend studying the same portions they use each week — and with our curriculum, you can! If your local church does not use the Torah portions, we recommend starting in Genesis 1 and taking 54 weeks to study the first five books together as a family, reading Scripture together even during weeks when you do no other school work. We will teach your children how to study the Bible for themselves, using inductive and deductive methods. Your children will learn, through daily use of the Scriptures, how to find Scripture passages, understand God’s Word for themselves, and apply it to their daily lives. Your children will also commit weekly verses of Scripture to memory, hiding God’s Word in their hearts so that they will not sin against God. This curriculum is best used with children from elementary through high school. If you have preschool children only, we recommend My First Torah by Heidi Cooper (Torah Family Living). We think you’ll love our curriculum, especially if you’re teaching several children at once. You will all be memorizing together, studying together, and applying God’s Word together. We’ve included easy lesson plans so that Mom doesn’t have to spend much time in preparation. In addition, we offer optional workbooks for each age, so that your children can keep what they have learned in a handy journal. It’s cost efficient! We offer the Parent-Teacher Edition to you as an inexpensive e-book download, or you may purchase it as a printed, wire-bound book to save the cost of printing it yourself. It’s all inclusive! You can buy more resources if you’d like, but rest assured that our Parent-Teacher Edition is a packed program all on its own. We’d like to show you what a typical study of the weekly Torah portion looks like in our home. First, if we haven’t already done so, we start our day with prayer. Now we work on learning the week’s memory verse. We include many learning activities in the curriculum, such as illustrating the verse, daily recitation, and weekly copywork (manuscript and cursive). Dad, Mom, or an older student, then reads the day’s Torah portion aloud. You may use the Bible translation of your choice. Often we will suggest discussion questions and activities for you to do. Please feel free to add to or subtract from our suggestions, depending on the needs and interests of your family, always listening to the leading of the Spirit. Twice each week, we like to have a “Bible Drill.” This is a game in which children race each other to find passages of Scripture in their own Bibles. We urge you to play this game often so your children will gain the essential skill of finding passages in God’s Word quickly! Don’t worry — we’ll include complete instructions. Please be open to the Spirit of God as you work through His Torah. Always be ready to discuss important concepts with your children and answer their questions. We have added possible answers and additional notes to discussion questions. If you come up with additional learning ideas, record them so that you’ll remember them next time you cover this material. Ask God to make His Torah meaningful to each of your children. We offer a 1-year plan to studying the Torah. Lesson plans each include 54 weeks of traditional Torah-portion readings, as well as 7 additional “double portions” for years when weekly readings are doubled up. We also include two readings for Pesach (Passover), plus Yom Kippur (Day of Atonement) and Sukkot (Feast of Tabernacles). This curriculum should be available for sale soon! Foundations of Torah: Parent-Teacher Edition is a stand-alone curriculum designed to be used by parents with their entire family from kindergarten up. 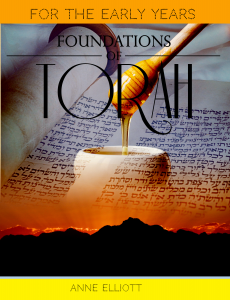 Daily lessons include verse-by-verse readings through the entire Torah (Genesis, Exodus, Leviticus, Numbers, Deuteronomy), with complete discussion questions AND answers, plus suggestions for additional activities. Space is provided for weekly prayer requests. Weekly memory verses suitable for wall display are included in the back of the book, where they can be torn from the book and saved for future years. This book will be available as a printed, coil-bound book. This book will be also be available as a PDF e-book download. Foundations of Torah: For Early Elementary is an optional workbook designed to help younger children remember what they learn during daily Torah time. Each week’s lesson includes space for Hebrew language copywork, illustrating the memory verse, Bible copywork, and additional optional activities. Manuscript font is used for all copywork examples. Foundations of Torah: For the Middle Years is an optional workbook designed to help middle-aged children remember what they learn during daily Torah time. Each week’s lesson includes space for prayer requests, Hebrew language copywork, illustrating the memory verse, Bible copywork, optional activities, and a journal page for recording what is learned. Cursive font is used for all copywork examples. I know there are some very obvious differences between the original Foundations Bible curriculum and this Foundations of Torah curriculum (difference in amount of time spent on the Torah, for one), but I was wondering what the other differences are, if any? Or are they just a different schedule of the same materials? Foundations Bible reads through the the entire Bible, where Foundations of Torah only reads through the first 5 books (Genesis, Exodus, Leviticus, Numbers, Deuteronomy). Foundations Bible has 36 lessons per year (for a total of 3 school years), but Foundations of Torah is 54 weeks long, covering one calendar year. Foundations of Torah is a brand-new curriculum, covering EVERY VERSE of the first 5 books of the Bible, with many references to the rest of the Old Testament but especially to the New Testament. The discussion times are probably a bit longer, and there are suggested discussion topics for EVERY day. Foundations of Torah includes links to weekly coloring pages for younger children, as well as links to matching worksheets for middle-school and high-school students. Foundations Bible includes additional independent Bible reading for older students, but Foundations of Torah does not. Both include Bible drills. 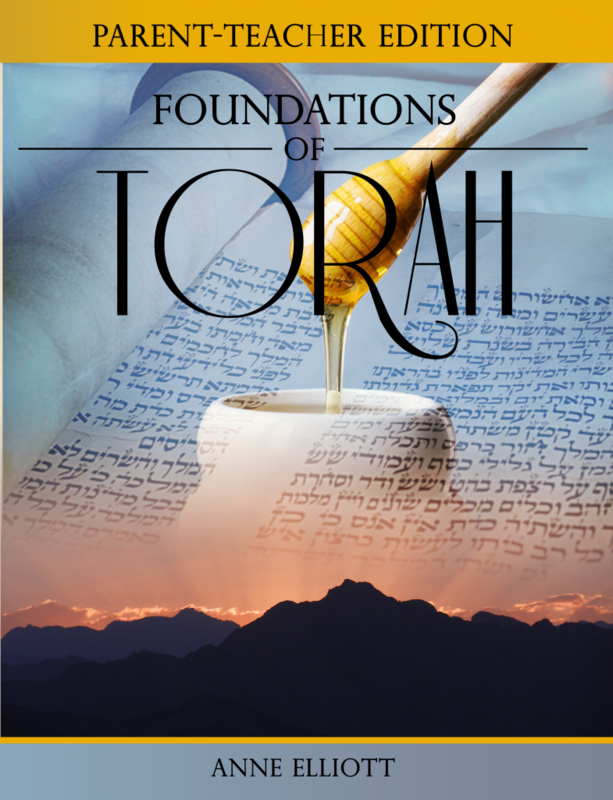 Foundations of Torah assumes your children already know their way around the Bible well, and only 5 verses are included in each drill, but all drills cover topics being discussed that day. The memory verses are entirely different. The Foundations of Torah curriculum includes space for weekly prayer requests. 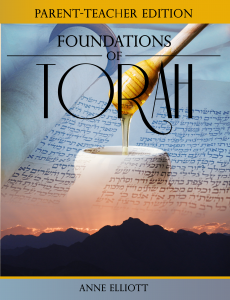 Foundations of Torah will include *optional* copywork books and journals for the students. Here is a big difference: In Foundations of Torah, we assume that the laws of God STILL apply to us today, and we discuss these in great detail. We do not emphasize this in Foundations Bible curriculum but rather focus more on salvation through Jesus (Yeshua) our Messiah. However, because we believe in BOTH these key doctrines, both curriculum will teach that Jesus is the only way salvation and that we should live holy, obedient lives after repenting and trusting in Him.